If I had to characterise January 2017 in one word I'd say 'chilly'. We've had some rain, a little snow, but predominantly it's been the cold days and even colder nights, with widespread frosts and fog, which have been most noticeable. Some days would be beautiful, but the following day the fog would never lift, or the cloud ceiling would remain stubbornly at about head height. All change for the first few days of February, predominantly wet and windy weather, but mild. I spent Feb 1st in Dublin on another day trip from Stansted. This would be my last mid-week day off as I finished work on Friday Feb 10th after 43 and a half years! 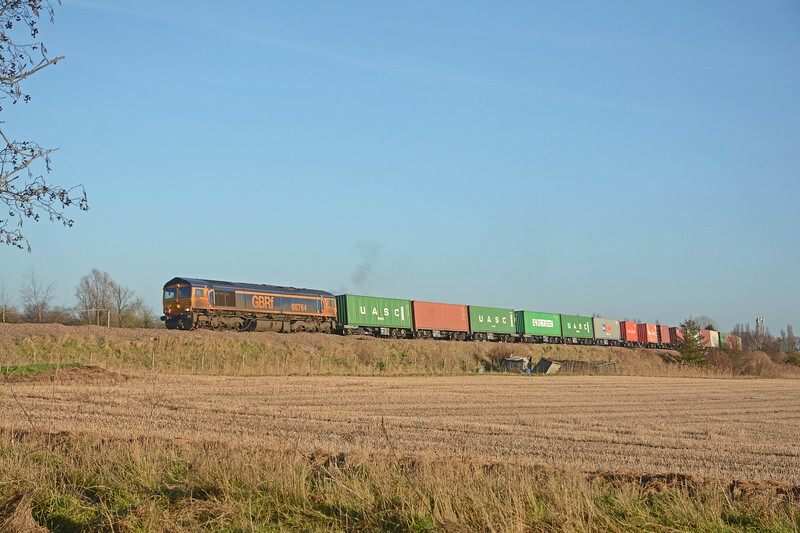 66764 speeding round the curve west of Whittlesea on the 4M29 Felixstowe to Birch Coppice.